We’ve arrived. The ultimate food-centered holiday. THANKSGIVING! Where we stuff our guts full of tradition and mashed potatoes. And I’ve got a 10-pound turkey’s worth of tips and recipes for you, to make sure that your table remains full of flavor and favorite dishes, while keeping the feast bright, fresh, healthy, and of course low-sodium. But I also want to take this moment (and electronic Internet page) to throw something else out there: Let’s use this Thanksgiving to honor not just ourselves and our family tree, but the culinary history of others. Amidst everything happening right now and all that has bubbled to the surface of our daily lives, it feels silly and trite and, well, privileged to celebrate a feast of riches. But like anything else, you can transform something icky into something inspiring. So this year, let’s look outwards to reconnect inwards. Let’s fill our casseroles and serving trays with food inspired by cultures and religions and edible legacies that are not our own. And instead make recipes from other countries far away or even our neighbor’s kitchen close by. Use this opportunity to reach out; to try something unfamiliar; and show appreciation for diversity and difference. And don’t just stop at the food. Invite others to the table — there are plenty of people looking for a warm, welcoming “home” this year, so open your doors. Because it is the nature of the melting pot which makes our world (and our food) more interesting. With that, let’s dive into a bunch of menu ideas. There will be new recipes (many from my new book, LOW SO GOOD) as well as old favorites sprinkled throughout (so, enjoy!) 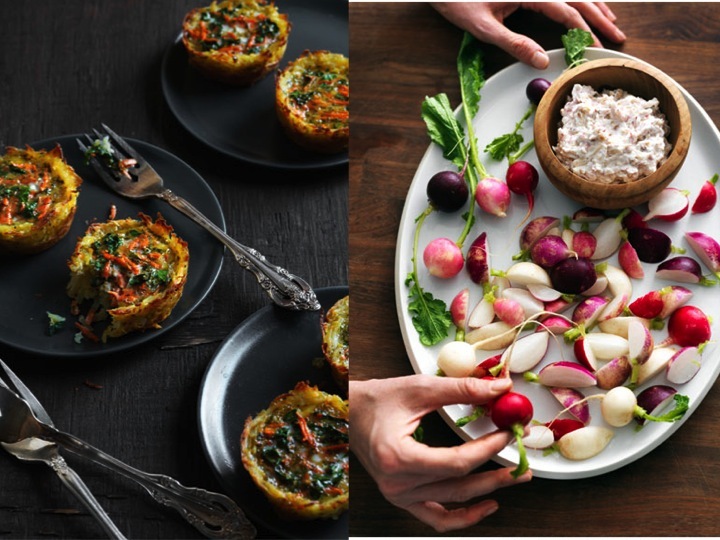 And if you’re hosting guests with a host of dietary needs, please check out this INSANE GUIDE that I created for @Food52 that make your favorite dishes two ways, but simply splitting it in half — keeping one traditional with all the things, and the other with a gluten-free, dairy-free, vegan, and #lowsogood twist. Best part, the recipes are simple! And most only have just a handful of steps and ingredients and adjustments. So you won’t loose too much sleep, money, or sanity. Here’s a little vid of me making mashed potatoes. 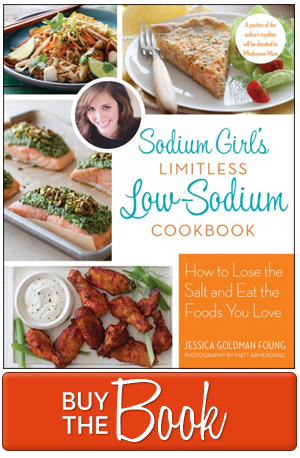 And please PLEASE comment below or on Sodium Girl’s Facebook page with your Thanksgiving menu, tips, and tricks. Above all, I’m so grateful for the ability to share with and learn from others. So don’t be share — we cannot wait to see what creative dishes you make! Do not make everything from scratch. Take shortcuts where you can, especially when it comes to food prep (like: pre-cut garlic and pre-cubed butternut squash) or food for your non-special diet guests (like: prepared appetizers, gravy, and even pie crusts). That way you save your time for all the food you need to make from scratch. 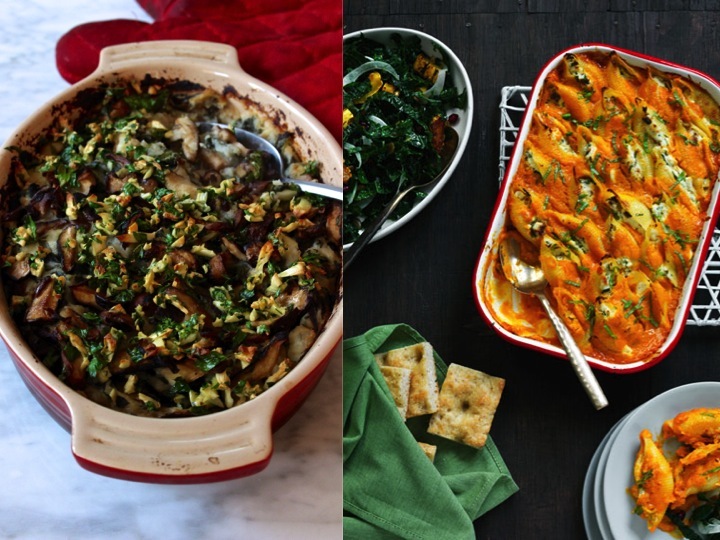 Also, don’t be afraid to make Thanksgiving a potluck. Guests tend to have their favorite dishes, so let them bring grandmas casserole! The more the merrier. Just be sure you have options for those guests with special diet needs. And be sure to label everything! You don’t want vegan Uncle Phil to chow down on that turkey broth-soaked stuffing! When feeding many mouths with many food needs, you can use the @Food52 guide above, and make something for everyone. You can host a FLEXIBLE FEAST. Or, best of all, make dishes in SMALL PORTIONS — like individual mashed potatoes or MINI GREEN BEAN CASSEROLES or even pumpkin pudding (recipe at the end!). That way you can add and embellish accordingly! And finally, let guests get their hands dirty. Of course, you don’t want too many cooks in the kitchen, but you can add little touches to your table that allow everyone to be a part of the finished dish. For example, instead of flowers, put mason jars with fresh, leafy herbs along the center (parsley, dill, and cilantro are great). Then people can pick and sprinkle at will! Or for dessert, give everyone a mini mason jar with a lid. Fill each jar 3/4 full with heavy cream and a scoop of powdered sugar. Then tell everyone to shake for 5 minutes and ta-da, individual whipped cream! The more people interact with the food, the more they will enjoy it. Plus, it’s free entertainment! You can cancel the magician. I think it’s always best to keep starter snacks (1) veggie-centric and (2) simple — like dips and spreads. That way it’s just enough for people to nibble on, but not enough to ruin the meal. Added plus, it’s a perfect time to sneak more color and nutrition into your menu, before you dive into the starch fest! So, when planning little bites for the big day, think: bright, fresh, and produce heavy. 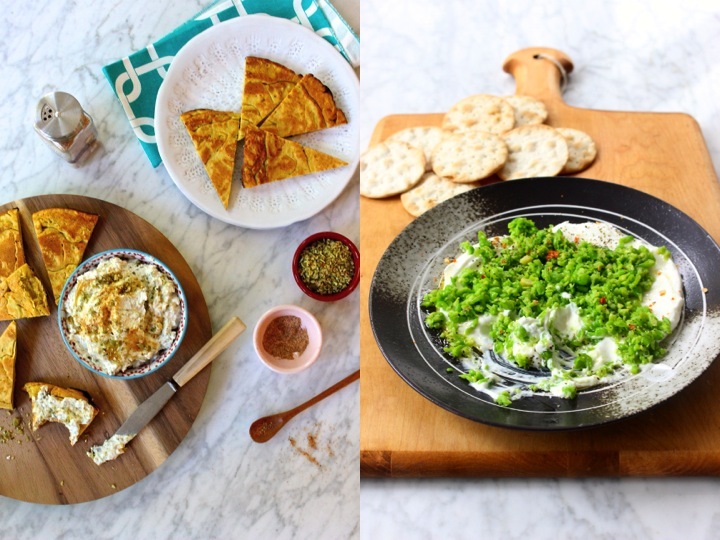 With that in mind, this CAULIFLOWER NUT RICOTTA, SMASHED PEAS WITH YOGURT (literally smashed peas over yogurt), and CREAMY BROCCOLI DIP definitely fit the bill. If you have time and want to get fancy, go ahead and whip up this SMOKED FISH too. 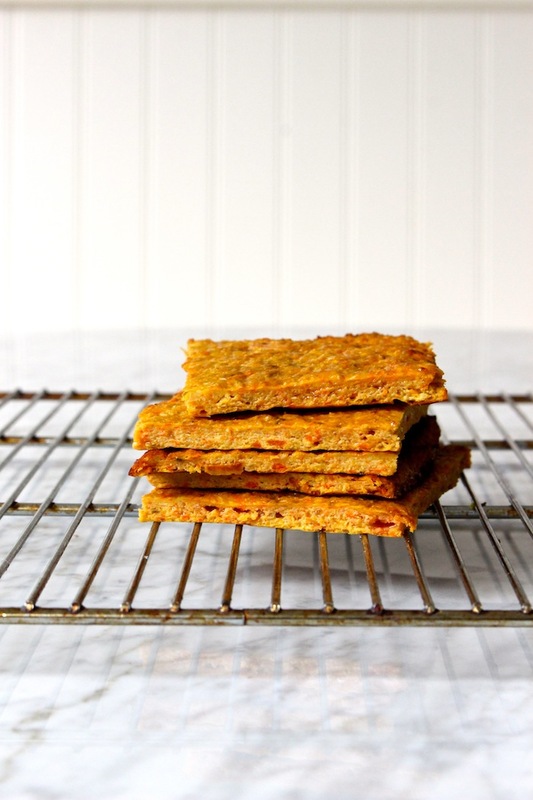 And while you can always buy salt-free rice crackers at the store, if you want to make everything from scratch, try these easy CHICKPEA FLATBREAD CRACKERS, PASTA CRACKERS, or microwave VEGGIE CHIPS. Perfect for scooping, dipping, and spreading. 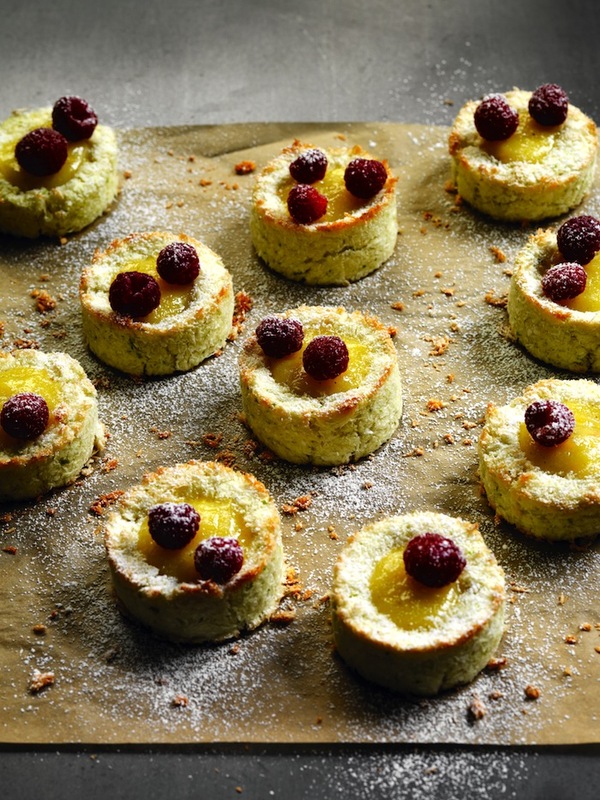 And if you’re craving mini tarts, skip high-sodium prepared dough or phyllo (or going through the trouble of making your own), and use hash browns instead for a quick HASH BROWN QUICHE. Then fill with kale, mushrooms, peas, shredded carrots, or whatever you have on hand! Okay, so now we are heading into serious veggie territory. And again, I have strong feelings here — your veggie sides should be bright, fresh, and free from heavy ingredients (read:cream), because there’s enough of that later. It’s also nice to do a mix of sides that are mostly raw (aka: no oven needed! 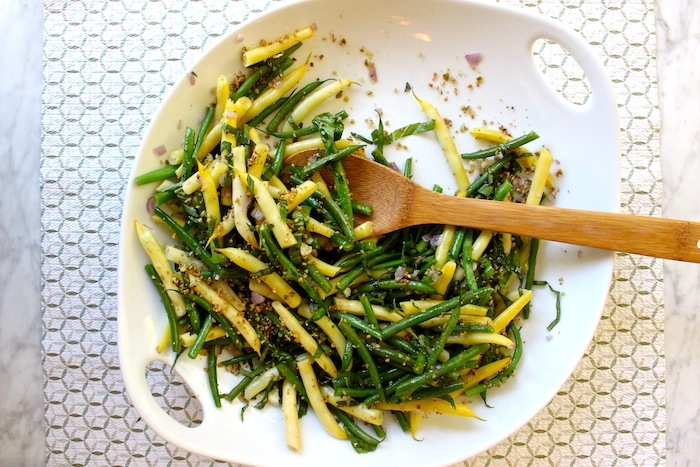 ), like: this CARROT RIBBON SALAD or THIS BEAN MIX. But since the oven is on, you can put it to use with these ROASTED CARROTS WITH FENNEL and this ROASTED CAULIFLOWER WITH ANCHO CHILE. As for salad, I’m a huge fan of this RICED CAULIFLOWER SALAD situation (but you could always use broccoli for more diversity!) and the massaged KALE AND DELICATA SQUASH SALAD (from my new book!). Because there’s just not enough food on the Thanksgiving table, we have to also have bread. And while store-bought loaves are typically high in sodium, it is very easy (and very impressive) to make your own. Like this CHALLAH, this BOULE, or the FLATBREAD from my new book. Don’t be afraid to adjust the recipe with holiday flavors by adding in crushed nuts, fresh rosemary, or even pomegranates or cranberries! Let’s be honest for a second and just admit that Thanksgiving not typically the most colorful of meals. The turkey, the potatoes, and yes, the soup — they all tend to land on the orange/brown side of the wheel. So you can stick to a traditionally-flavored soups, like CARROT or DOUBLE BUTTERNUT SQUASH (in my new book). 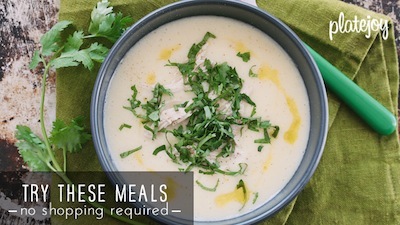 Or even this addictive and creamy CAULIFLOWER SOUP by Paul Bertolli that needs little to no #lowsodium adjustments because it doesn’t even use broth! And speaking of broth, if you don’t have time to make your own, here’s a LIST OF EASY SUBSTITUTES. But remember what we chatted about at the very beginning — this is also the perfect moment to do something crazy (and colorful! ), spice it up a bit, and go with an untraditional route. So if you’re feeling brave, or bored of orange/beige things, try this GREEN PEA AND TOMATILLO POSOLE (from my new book and below). Your tastebuds and your eyes will be very grateful. Casseroles tend to bubble with dairy, cheese, canned soup mixes, breadcrumbs, and of course, a ton of sodium. But that doesn’t mean you have to skip the casserole this year. First, look for low-sodium cheese options. Right now, Whole Foods 365 Brand has a swiss with only 15mg per slice and parmesan with only 40mg per 1 Tbsp. 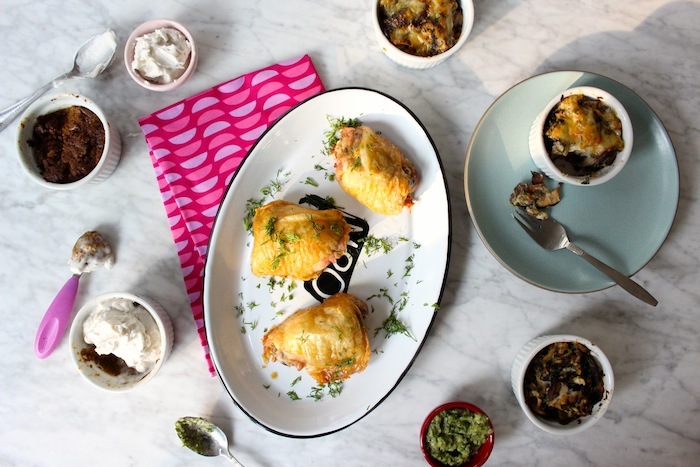 And that means, with good portion control, you can still make those that zucchini or potato or root vegetable casseroles you love, all covered with cheese. Second, ditch the high-sodium soups and broth and make a quick MUSHROOM BROTH instead. If you’re looking for more of a soup texture add no-salt white beans and blend for richness and thickness. Or third, use pureed vegetables like butternut squash and cauliflower to act as the creamy cheese. Or finally, make this life-changing ROASTED ONION CREAM. Which makes the house smell ah-mazing and makes everything it touches creamy without a drop of actual cream. As for those breadcrumbs, you can make and season your own by using store-bought no-salt added bread (or leftovers from that boule or flatbread). You can also use crushed no-salt-added nuts, potato chips, or cooked hash browns (which get nice and crispy, like those fried onion things). Or you can choose the super healthy route and use finely chopped broccoli florets. For those who can eat potatoes, start with normal potato procedures — a.k.a. boiling those peeled spuds. Then, rouchly chope them up and put them back into the now-dry pot over a little heat. This lets them dry out a bit from the water bath. Now comes the fun. 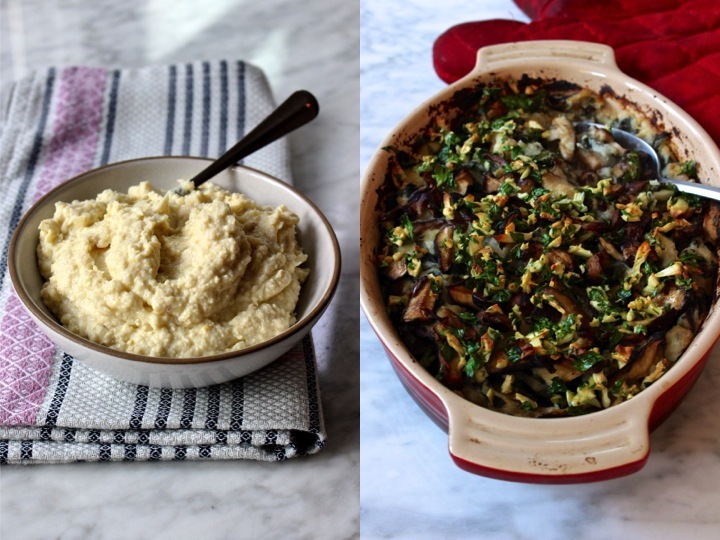 Skip the cream and dairy in a traditional recipe, and in its place, use that VEGAN ONION CREAM (above) or some of the CAULIFLOWER RICOTTA (also above). Or go for something totally different and give your potatoes flavor and richness with something new, like pesto, roasted tomatoes, HOT SAUCE, or CHUNKY CARROT DRESSING. 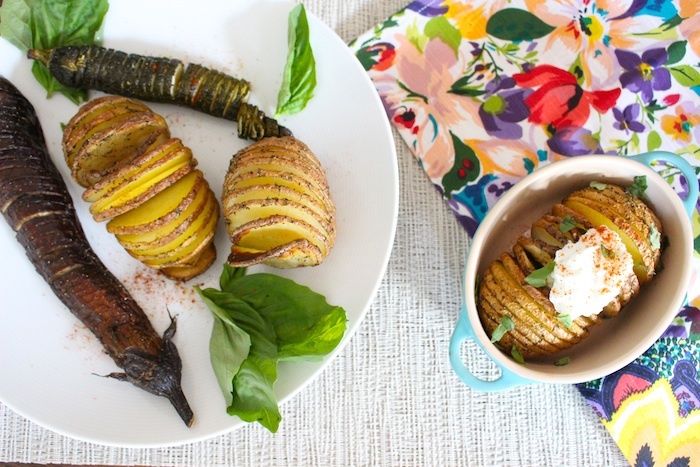 If you are more of a French fry/crispy type, try these HASSELBACKS instead. And if you want something without the spuds altogether, make FLUFFY CAULIFLOWER instead. 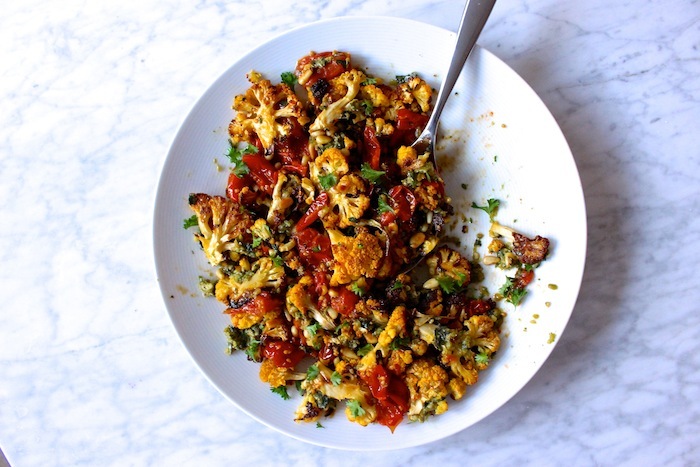 Or swap in something new, like pesto or roasted peppers. This other new and nifty NATIONAL KIDNEY FOUNDATION video has plenty of ideas for you. Surprise those tastebuds by adding PICKLED CHERRIES, BAKED GRAPES, and ROASTED GARBANZOS for unexpected tang and texture. Or serve up this ROASTED SWEET POTAT SALAD WITH CRANBERRIES for a total holiday mash up. Or skip the stuffing and MAKE A SEASONAL SAVORY TART. Here’s everything you need to know about BUYING BRINE-FREE BIRDS, CREATING BIG FLAVOR WITOUT BRINE (and crispy skin), and CARVING the dang thing. But here’s another tip: SKIP THE BIRD altogether. 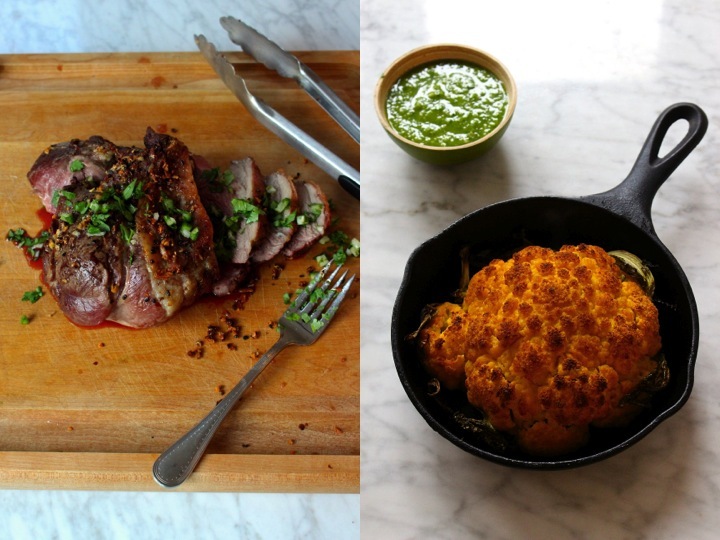 Go with a roasted chicken, or balsamic glazed guinea hens, or a GORGEOUS LAMB. A whole ROASTED CAULIFLOWER for those non-meat eaters. Or ANY OF THESE NON-TURKEY SUGGESTIONS (thanks again, Food52!). And give yourself permission and creative license to explore new proteins and new spice blends (that don’t need to be soaked in salty solutions to stay moist). Not to mention, cut down on prep time and effort. Finally, unbutton your pants or go change into sweats because it’s dessert time. If you’re making pie, skip the high-sodium store-bought crust and graham crackers, and use MATZOH CRACKER CRUST instead. 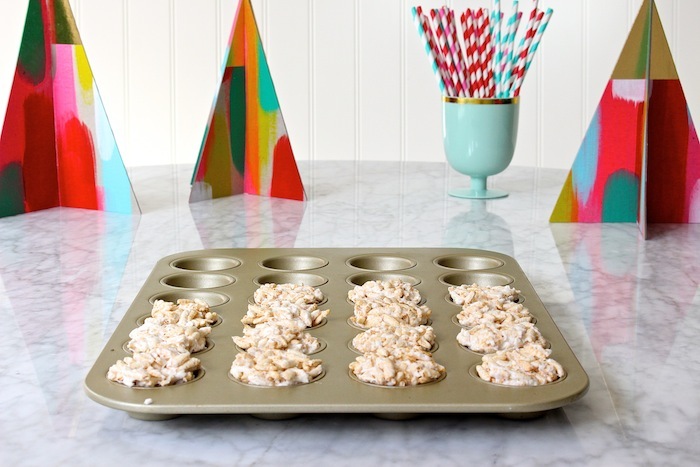 Or, make mini tarts out of a MACAROONS. 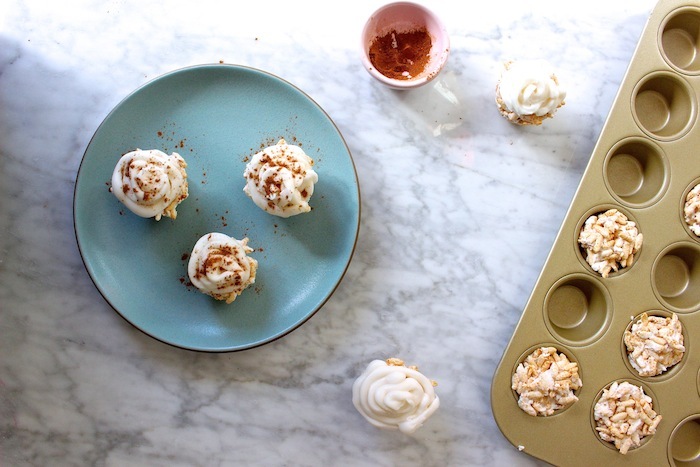 Or get really lazy, and make RICE CRISPY CUPCAKES with PUMPKIN SPICE FROSTING (which is literally rice crispy mix molded into a mini muffin tin, topped with vanilla frosting, topped with a sprinkle of pumpkin spice). Or skip traditional desserts and make these chocolate covered DATE CARAMELS or these MARSHMALLOWS. Or get it completely right this year by making this no-fail PUMPKIN PUDDING (see altered recipe below). Or make it all, because you unbuttoned those pants and there’s room. Preheat oven to 375° F. In a large bowl, beat eggs. Add in the spices and pumpkin pie mix. Then gradually stir in the milk. 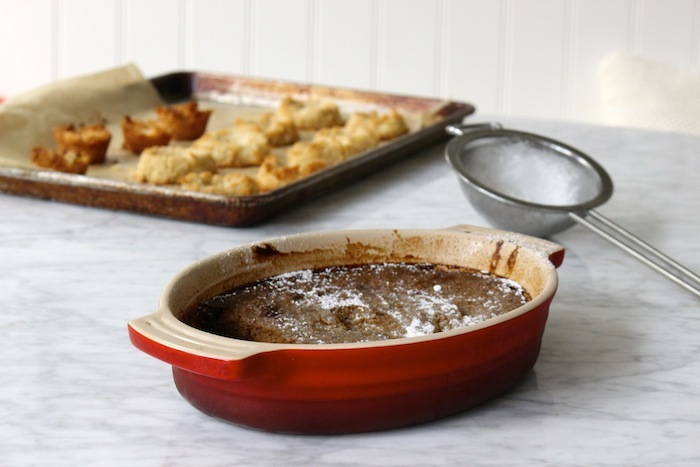 Pour into glass or ceramic baking dish. 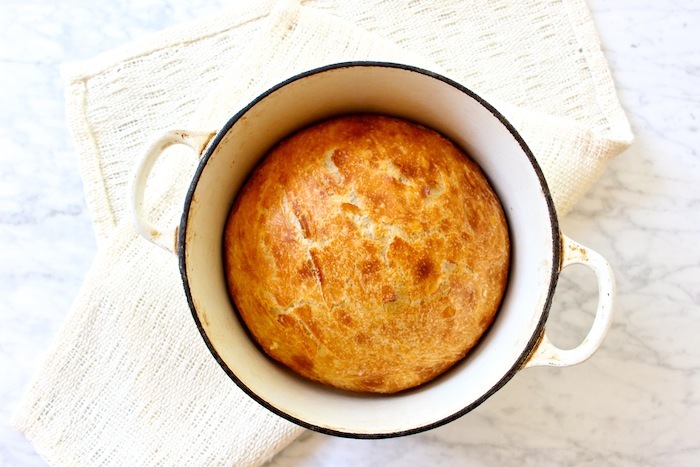 Bake until the top gets a dark brown skin (so good!) and knife inserted in the center comes out clean, about 45 minutes to an hour depending on size and shape of dish. Cool on wire rack, then refrigerate overnight, until ready to serve. Serve with whipped cream (dairy or coconut).